Apologies for the lopsided nature of these pictures--the camera battery died before I could redo! 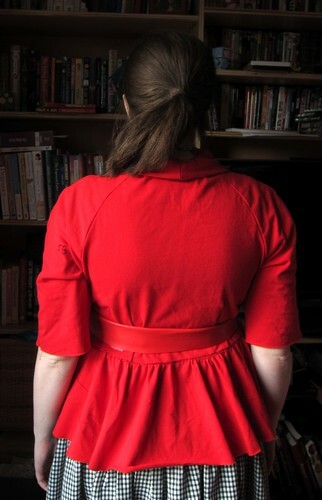 Thanks for all the feedback on the cardi/jacket muslin from my last post on it--most of you felt that the collar would be a good idea, so I went ahead and basted it on, and I think you're right--it does look more finished. I'll leave the length even all around after all. It's short enough to work for maternity, but long enough that it might work for a while post-maternity, too. The FBA itself is just fine. I need to rotate the horizontal dart I added to point towards the apex. I definitely need to add some front width, though--at least 2 inches total. It's supposed to wrap at least a little! I'll take in the sleeve seams a bit. I honestly have no idea how to fix these baggy raglan armholes--so whatever. It's a knit cardi-jacket. And the fashion fabric is much nicer/smoother than this crummy wrinkle-prone stuff, so maybe I won't get the same wrinkly effect. I'm going to baste the final together before serging in case further tweaks are needed, but I'm done with this muslin! 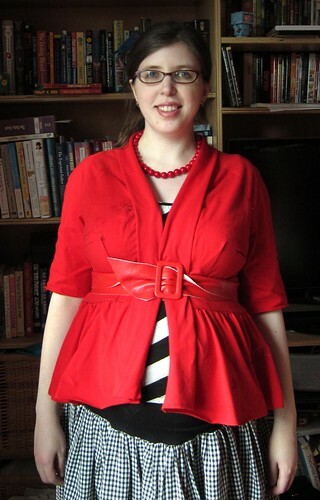 Definitely going to replace this gathered peplum with a smoother eased peplum with a lot less fullness. But not tonight. This pregnant seamstress needs to put her swollen feet up, cuddle with the cats and take a nap. By the way, your RSS feeds seem to have stopped updating in lat March; I don't know if you turned them off for privacy or if it's a Blogger hiccup. I was glad when I clicked over and saw that you were still updating and I had a bunch of posts to read. Looks great so far! The red is awesome on you! Lydia, I think that may have been when I switched from blogspot to polkadotoverload.com ... I have a new feed now.